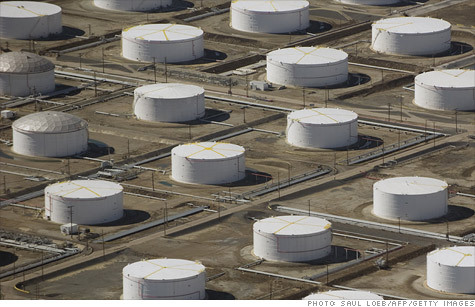 An oil depot, or fuel farm, is seen from the air over Carson, California. The industry has a plan that could make the country energy independent - but that would entail drilling nearly everywhere. NEW YORK (CNNMoney) -- The United States is undergoing an energy boom -- but the oil and gas industry says it could be much, much bigger. A study last year commissioned by the American Petroleum Institute said that if every piece of federal land -- excluding national parks -- was open for drilling, North America could produce an additional 10 million barrels of oil a day by 2030. At today's consumption level, that would eliminate the need for any other imports. And the additional drilling would create 1.4 million jobs and $800 billion in tax revenue, according to the study. "It's time our national energy policy let America take advantage of this opportunity," API President Jack Gerard said in a press release at the time. API represents big oil companies like Exxon Mobil (XOM, Fortune 500), Royal Dutch Shell (RDSA) and BP (BP), and the study was conducted by energy consultants Wood Mackenzie. But oil production on that scale would come with trade-offs. There would be drill rigs off beaches up and down the East and West Coasts, as well as near the Florida Keys. Wilderness areas in national forests and Alaska would be crisscrossed with roads. Canada's oil sands, which critics are bitterly opposing on the grounds that they would exacerbate global warming, would be fully developed. Hydraulic fracturing would occur in watersheds nationwide. "We don't think the country would benefit at all," said Athan Manuel, director of the lands protection program at the Sierra Club. Manuel noted the huge amounts of tourism dollars that beachside drilling could put at risk, as well as the loss of wildlife habitat. Plus, he doubted the industry could get another 10 million barrels a day even if it could drill everywhere. And even all that additional oil may still not bring down gas prices. By 2030 the world is expected to consume over 100 million barrels of oil per day, and it's unclear what impact an additional 10% would have on prices. Plus, OPEC could decide to cut production by 10 million barrels a day, leaving the overall supply picture unchanged. Even without additional drilling, the United States is an energy powerhouse, and is becoming increasingly more so. As of the end of 2011, the United States was producing 10.4 million barrels of oil a day, according to the Energy Information Administration. That's more than Saudi Arabia's 9.8 million barrels per day. The U.S. figure includes liquids from natural gas wells, gains made in the refining process and ethanol production -- all of which can be used to make gasoline. Saudi Arabia does not make a comparable number public. On a pure crude oil basis, Saudi production stands at 9.8 million barrels a day while the U.S. is at 5.8 million barrels per day. The Obama administration can take some credit for the increased production, but high oil prices and new technologies are the bigger drivers. Oil that didn't make business sense to drill for at $30 a barrel becomes viable at $60 or $100. And the industry has been increasingly coupling the ability to drill horizontally with the expanded use of hydraulic fracturing, also knows as fracking, which has increased the production of both oil and natural gas. Many fear the process of using pressure, water and chemicals to ease extraction is contaminating the ground water. Some want it banned altogether. The amount of acreage available for drilling under the Obama administration has actually declined compared to what the previous administration offered. But Obama has allowed drilling in the Arctic to move forward and done little to restrict fracking. During this election season, Americans will likely hear from forces on both sides pushing for either a more or less aggressive approach to drilling. And as the easy to reach oil runs out and new sources become increasingly hard to get, Americans will have to decide what trade-offs the nation wants to make.